CMA CGM is now the third largest container line in the world, but its illustrious history includes some of the world’s greatest ocean liners, such as the Paris, Ile de France, Normandie, Liberté and France. It was in recognition of this past that, after CMA acquired the state-owned CGM in 1996, CMA CGM chairman and ceo Jacques Saadé instructed that passenger accommodation be installed in a number of their newbuilding container ships. 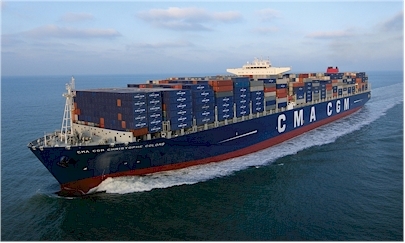 Many CMA CGM ships to this day still carry up to twelve passengers each, the maximum number allowed on a cargo ship. The Cruise People first announced the introduction to service of the giant container ship CMA CGM Christophe Colomb in November 2009 but in her initial period of service the passenger accommodation was reserved for company guests and VIPs. More recently, the 13,800 TEU CMA CGM Christophe Colomb and sister ships have been operating on French Asia Line 5, but with a recent realignment of Far East schedules with the Mediterranean Shipping Company, these ships are now transferring to the French Asia Line 1. Voyages now commence in Southampton and calls are made in Hamburg, Bremerhaven, Zeebrugge, Le Havre and Malta before the ship sails for Khor Fakkan, Jebel Ali, Ningbo, Shanghai, Xiamen, Nansha, Hong Kong, Chiwan and Yantian, returning via Port Kelang and Tanger Med to Southampton, a full round voyage of 77 days. French flag: CMA CGM Christophe Colomb, CMA CGM La Perouse and CMA CGM Amerigo Vespucci. British flag: CMA CGM Magellan and CMA CGM Corte Real. Cabins and Suites: Each ship has five passenger cabins on Deck F. Each Cabin or Suite is fitted with: refrigerator, sofa, coffee table, desk, an easy chair, wardrobe and chest of drawers, wall mirror and private lavatory unit with shower, washbasin and WC. Double beds measure 200 x 160 cm (6’6½” x 5’3″) and twin beds 200 x 120 cm (6’6½” x 3’11¼”) each. Suite E-718: about 37 m² (398 sq ft), twin beds, two side windows and three windows aft, plus 14 m² (150 sq ft) Terrace Deck with the cabin; Cabin A-701: about 30 m² (323 sq ft), one double bed, three forward and two side windows; Cabins B-712 & C-714: about 23 m² (248 sq ft), one double bed, three forward windows; Cabin D-716: about 23 m² (248 sq ft), one double bed, two forward and two side windows. Public Areas: Gymnasium, about 28 m² (300 sq ft), on Deck A, Ping-Pong table, rowing machine, home trainer, darts; Swimming Pool on Deck A; Passenger Lounge, on Deck F, fitted with a game table, TV and DVD reader ;Library on Deck F with a desk; Officers Mess Room (by invitation only). Like the “Christophe Colombe” class ships, the slightly smaller (but still huge) “Cassiopea” class also feature five double cabins and similar public areas. Fares: Valid from February 2012 in Euros, per day and per person, covering travel with full board and complimentary wine with lunch and dinner, including port charges. Cabins €110 per person per day in double occupany, or €110 for single occupancy. For Owners Suite, please contact us for details. Note: For voyages of less than 10 days duration, daily fare is €130 (double occupancy), and €150 (single occupancy). For further details and information on any of these voyages please call Miri Lopusna at The Cruise People Ltd in London on 020 7273 2450 or e-mail cruise@cruisepeople.co.uk.